On Friday, February 28, 1975, at the General Centre, Mrs. Elizabeth Desjardins, in her 79th year, beloved wife of Edward Desjardins, of Suite 2A, 56 Cosmos Place. Mrs. Desjardins was born in England and came to Canada in 1919. 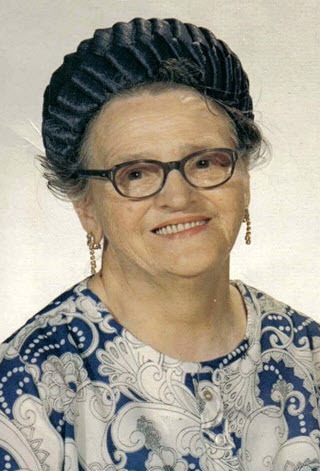 She was a member of St. Saviour’s Anglican Church, the Senior Citizens Choir of Winnipeg; Past President of Grey Street United Church Senior Citizens; life member and Past President, Lodge Lady Grey, Daughters of England. She was a life member and Past President of the Ladies Auxiliary, Brooklands and Weston Branch of the Royal Canadian Legion. Mrs. Desjardins was holder of Meritorious Service Award for her legion work. She was also a member of the Provincial Council of Ladies Auxiliaries, having served as District Representative of District 5 B. Surviving besides her husband Edward are her two sons, Wilbrod and Edward of Winnipeg; two daughters, Edith (Mrs. Larry Jacques) of Winnipeg and Kathleen (Mrs. Joseph Carniato) of Thunder Bay Ontario. 11 grandchildren and five great-grandchildren; also surviving are three sisters, Jane, Dorothy and Kay of England and three brothers, William, Richard and Sam also all of England. Funeral service will be held 1:00 p.m. Tuesday, March 4 at the Thomson Funeral Chapels, Broadway and Furby. The Reverend William McGregor officiating with cremation following. Service will terminate at the funeral chapels. In lieu of flowers, donations may be made to the Manitoba Heart Foundation.